Sandra is an 11-year breast cancer survivor and a first-time Art Bra artist. She has several years of artistic experience, including earning an art degree and becoming an art teacher in the Dallas public schools. Though Sandra has since moved on to a different profession, she still loves to create and is happy to be able to use her skills towards a cause so dear to her heart. Sandra designed this art bra for her daughter’s mother-in-law, Christina Tobin, who will be modeling “Mother Nature” in this year’s show. Sandra was diagnosed with breast cancer just a year before Christina and she is grateful to be able to call themselves both survivors. In creating this piece, Sandra was inspired by Christina’s love for hiking and being in the outdoors. 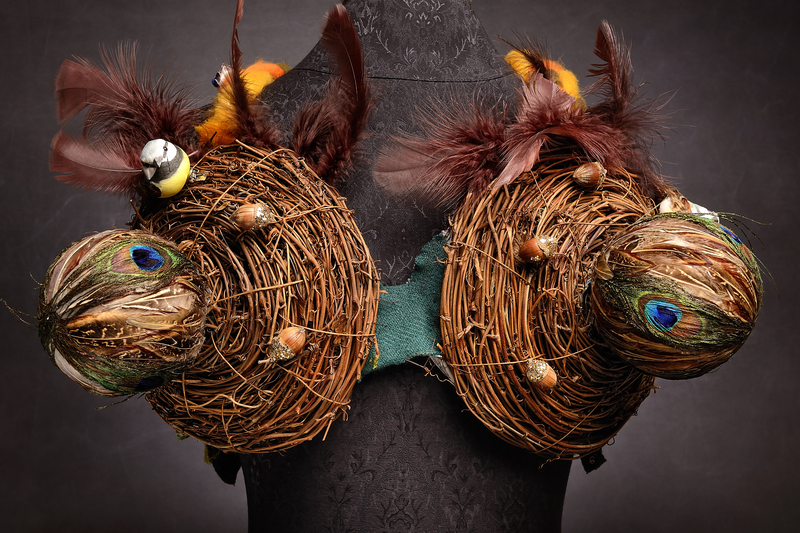 She wanted to express Christina’s affinity for nature, and in doing so, the art bra is created almost entirely from natural elements. Its central design is primarily made from dried willow and the bra straps are made from natural spun wool. In addition to using warm colors found in nature, Sandra also incorporated vibrant peacock feathers and sparkles of glitter on the acorns to add a touch of femininity. She then added feathers and a black and yellow bird figurine to complete the “Mother Nature” look!